Formerly Plainfield-based singer-songwriter Django Koenig is a multi-instrumentalist, playing trombone, guitar and piano. He also pulled double duty as the drummer for Americana outfit TallGrass GetDown before moving to the West Coast this fall. 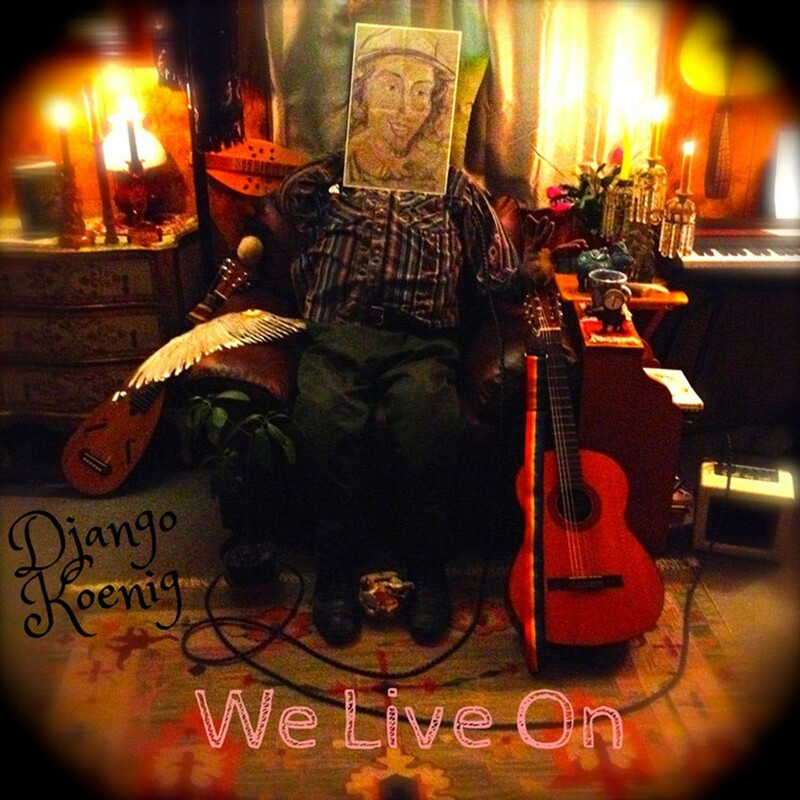 Koenig dedicated his recently released debut solo album, We Live On, to his friend Max Weaver, a Morrisville musician who passed away in 2013 at the age of 27. Accordingly, much of the record deals with grief, loss and recovery. But We Live On is hardly a gloomy affair. Surprisingly little sadness seeps into Koenig's songs. Strong harmonies, fluttering guitar and country-tinged piano take the lead on most tracks, which are full of hope and enthusiasm for life. The 50-second opener, fittingly titled "Snapshot," encapsulates Koenig's optimistic, brimming ethos: "Well there's no need to live your life / Living in shame and fear / For we are just a snapshot of life / Over millions of years." A cover of Bob Dylan's redemptive "I Shall Be Released" is up next. Though less nasally than Dylan, Koenig's voice fits the gravelly troubadour vibe. Koenig also recorded two tunes penned by Weaver. "Burning Old Pictures of You" is a comedy sketch of wanting to get over an ex. As the chorus goes, "If there's one thing I long in this world to do / It's drinkin' and smokin' and burnin' old pictures of you." "So Long" is a reflective look in the rearview mirror at a person who used to be. Weaver's original lyrics reveal a concern for losing himself: "I, I see the man I could have been / I feel that I'm wearing thin." A few tracks deviate from the life-and-loss theme. "Wade" aims to be a slice-of-life tribute to a lobsterman from Maine, but clunky storytelling gets in the way of Koenig's sincerity. The same is true for "Without a Flame," a number so stuffed with metaphors that its message fizzles out. The penultimate song, "Maxie Boy (We Live On)," is a slow, simple track built on peppy tambourine. This outright tribute to Weaver is touching but not overwrought. Koenig poignantly references Weaver's own lyrics, "You know that I, I feel that I am wearing thin / When I, I see the man you could have been / We all know that you live on, Maxie boy." The final number, "Happy Just to Know Your Name," is a breezy shrug to toxic, abandoned love. Here, Koenig's optimism is almost too hard to believe. With competing desires to pay respectful tribute to a lost friend, establish his own lyrical voice, and keep the folk vibe positive and humble, Koenig's freshman effort is a bit jumbled. Yet, listening to We Live On, you can't help but feel peaceful. Koenig has a big heart and yearns to share it.